Saar Enterprises incepted in the year 2009 are engaged in manufacturing, exporting and trading of Basmati and Non-Basmati Rice. 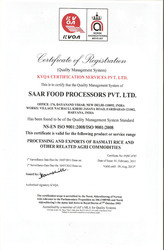 By providing qualitative array of Basmati Rice, Traditional Basmati Rice and Brown Basmati Rice, we have earned prestigious ISO 9001:2008 certification. We have established a good relationship with our patrons due to offering tasty and quality products. Our products are stringently tested on varied parameters in order to ensure that they are free from artificial colors and chemicals and provide good health. We produce these products in safe and hygienic conditions. We follow the stringent quality standards and maintain our products in safe and hygiene environment. Our clients are very much satisfied with the quality of products that we produce. We give the client the preferred premium quality products. These are offered in varied specifications as per the clients’ requirements and at competitive prices. A complete range of Rices are offered by the company both in its own brands as well as Buyers’ Brands. The company works under the guideance of "Ravi Gupta", with world class Rice milling and processing systems to ensure that the Rice produced and packed complies to the highest standards of Quality worldwide. Currently Saar exports Basmati Rice and other Agri Products to customers in Middle East, Europe, USA and Africa. Trading, Exporter and Outsource Manufacturer of a wide range of Basmati and Non Basmati varieties. We are fully integrated Rice supplier with in house processing in our Rice Mill, various kinds of packaging from Jute, poly laminate to Non Woven fabrics. A fully well managed quality lab and control systems are in place to ensure that every single grain that gets processed and packed is of the highest grade and purity. A complete range of Rice varieties both Basmati and Non Basmati are available in various pack types and sizes. These are also available in your own Private Labels.